[ACT](VC):COST [Counter Blast (1) & retire three rear-guards], your opponent chooses three of his or her rear-guards, and retires them. This unit gets [Power]+15000/[Critical]+1 until end of turn. 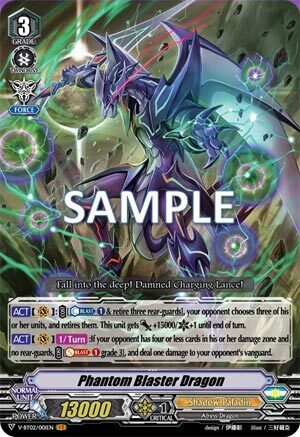 [ACT](VC)[1/Turn]:If your opponent has four or less cards in his or her damage zone and no rear-guards, COST [Soul Blast (1) grade 3], and deal one damage to your opponent’s vanguard. And now Shadow Paladin hits the big guns. At last we have the random advantage from Blaster Javelin and Macha, or the low quality advantage from Nemain actually translate into something meaningful. Sacking three to force the opponent to sack three of theirs is what OG Phantom Blaster Dragon should have been doing from the start (scaled to old meta cost-ratio anyway), so it’s a +0 wash to you and is a 38k with Critical including Force Gift. That’s worth sitting on him for. The second skill is a little meh. He’s obviously intended to be Late Game, given his cost, and while the passive Critical from the first skill makes it possible to float the opponent on 3-4 damage the extra damage might not change a whole lot, and isn’t especially useful to a clan that can easily keep 4 rear-guards like Royal Paladin. The backbone that makes the deck even work. Just about its only bad matchup is OTT but I’ll take one bad matchup since every deck needs at least one.